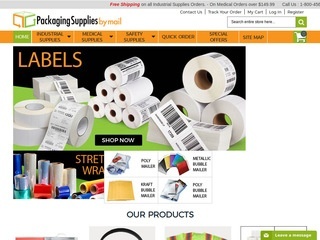 PackagingSuppliesByMail.Com is an industry leader for both industrial packaging and first aid medical supplies. We are a Ohio based corporation and have been MBE (Minority-Owned Small Business) certified since 2009. We’ve rapidly developed into a nation-wide leading distribution source. With the privilege to service everyday individuals as well as large entities, our company continues to expand as we’ve received Government Contracting Awards within the open procurement market. For the past s... Read more about packagingsuppliesbymail.com. Know any packagingsuppliesbymail.com coupon code/deal not listed here? Please post it & share! WEBSITE SALE - 10% OFF Industrial, Medical & Safety Supplies Offer Expires on 8/26/18. Note: Any packagingsuppliesbymail.com coupon codes and deals listed on these pages may have expired or be invalid. Where possible we have listed the expiry dates we believe apply, but these dates are not guaranteed to be accurate.